Late 1860’s CDV. Private Collection. A CDV in exceptionally clean condition. It looks as good as new. 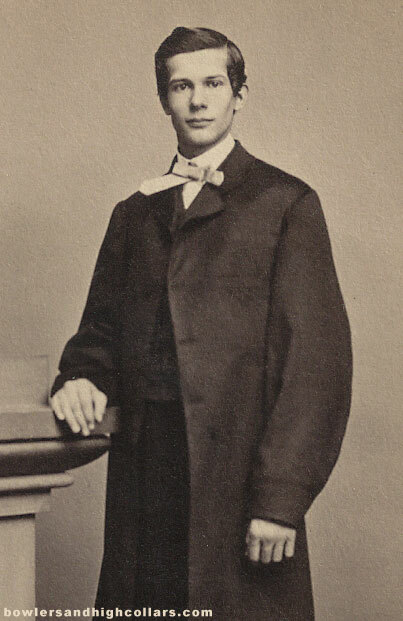 The young gentleman has the typical stately pose of the era with his arm lightly rested over the column’s foot. He is wearing high shine square toe shoes and a three button baggy overcoat over a large bowtie in fashion at the time. By looking at his hairstyle, the CDV design and the lack of tax stamp this picture was most likely taken between 1866-1870. This sitter is (omg) giving us a hint of a smile. Detail after the cut. Photographer: J.T. Upson. Buffalo, N.Y. This entry was posted on Thursday, April 9th, 2015 at 8:20 pm	and tagged with 1860s, Buffalo, fashion, handsome man, J.T. Upson, New York, smiling, USA, victorian, vintage photograph, whole body portrait and posted in CDVs, Gentlemen. You can follow any responses to this entry through the RSS 2.0 feed.